Welch, Deborah et al. "Historic Dunvegan". The Canadian Encyclopedia, 24 May 2018, Historica Canada. https://www.thecanadianencyclopedia.ca/en/article/historic-dunvegan. Accessed 19 April 2019. 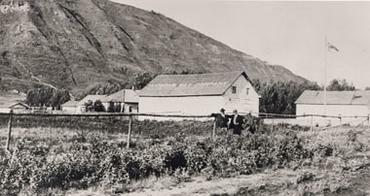 The Hudson Bay Company post of Dunvegan, Alta, was noted for its productive gardens (courtesy Glenbow Archives/NA-986-10). 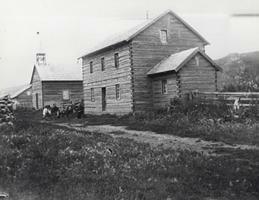 St Charles Mission established in Dunvegan in 1867, along the Peace River, is now a provincial historic site (courtesy Glenbow Archives/NA-949-31). Historic Dunvegan is a provincial historic site in Alberta located on the Peace River 26 km south of FAIRVIEW, Alta. In 1956 the St Charles Mission church and rectory there were acquired as a provincial historic park, one of the first in Alberta. In 1978, the HUDSONS BAY COMPANY (HBC) house, built at Dunvegan in 1877, was declared a provincial historic resource, and the site was expanded to include the St Charles Mission and rectory, and the site of the earlier NORTH WEST COMPANY posts at Dunvegan. One of the most important fur trade sites on the PEACE RIVER, a post operated at Dunvegan from 1805 to 1918. The first post was built by Archibald Norman McLeod of the North West Company to trade with the BEAVER and other First Nations who lived in the middle and upper reaches of the Peace River. He named the post after the MacLeod castle on the Isle of Skye. After 1821 the HBC operated the post, which was noted for its productive gardens and as a source of meat and leather for other posts in the district. In 1867 the St Charles Mission was founded by the OBLATES OF MARY IMMACULATE, a Roman Catholic missionary congregation. The mission operated until 1903. Between 1879 and 1891, the Anglicans also operated a mission, St Saviour's, at Dunvegan. Today the site includes the carefully restored and furnished Factor's House and St Charles Church and Rectory. The site is open seasonally from mid-May to September.